It might be a 300 year old historic church tucked away in the hills of Malvern, Pennsylvania, but St. Peter’s Church in the Great Valley still embraces what’s new, straddling both old and new with charm and ease. The old can be seen in the three sheep who keep the lawn trimmed around the historic structure. 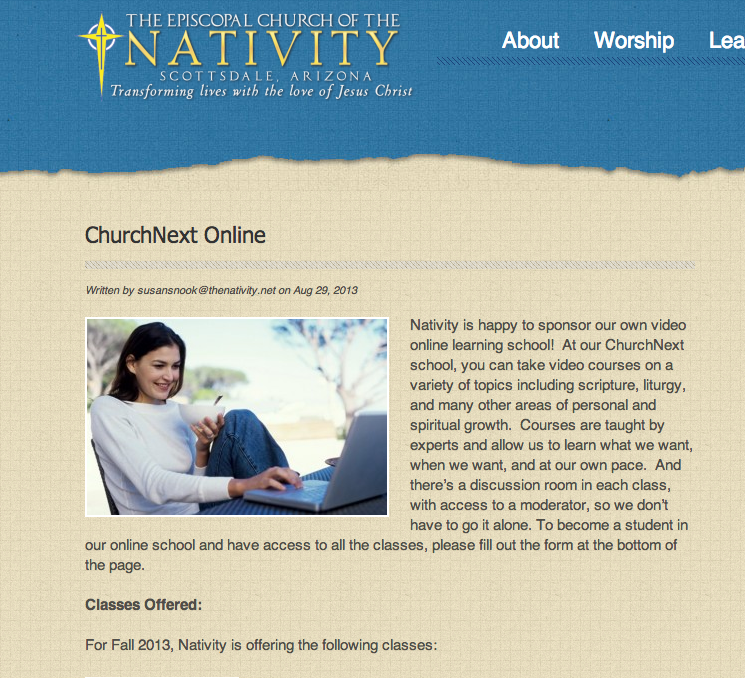 The new has come in the form of online classes offered through ChurchNext. The parish has opened up a few courses in the fall series, but will open up the entire bank of offerings beginning Nov. 1, allowing parishioners to choose their own courses. Both the young and not so young have been participating, and what has been particularly beneficial is that adults caring for older parents as well as young children can now also more fully participate. Rev. Bridgers states that they were expecting to have a least six members sign up for classes, but were extremely pleased when the sign up rate more than doubled that expectation. As for the old, that remains with the three sheep that graze the historic church property – no need for the newfangled lawnmower. Our three friends, along with the mandate of the church’s patron St. Peter, who directs us to feed “the flock”, have been the big influence on the online school’s name FLOCK (Flexible Online Learning in Community For the Kingdom), and they charmingly appear in the school’s logo –a sheep “doing its thing” at a computer. Three sheep, big FLOCK, eager parishioners and faithful staff are shaking things up a bit at St. Peter’s Church of the Great Valley, taking this bold step to sustain an age old commitment to lifelong living and growing in Christ in a brand new way. Growing old is a gift from God that some people would rather not accept. In this introspective and challenging course, author, minister, and popular speaker Barbara Crafton shares profound insights into how Christians can cope with aging. We live in an age-defying culture where youth is worshipped and aging is uncool. However, as we all know, aging is not to be avoided. In fact, we do well to embrace it. This course is designed not simply for older people, but younger people who are interested in pondering what lies ahead. Click here to learn more about this course and how to take it. The Rev. 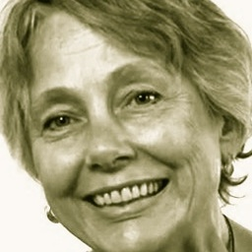 Barbara Crafton is an Episcopal priest, popular speaker, and author of several books, including the upcoming Church Publishing Incorporated book, The Courage to Grow Old. 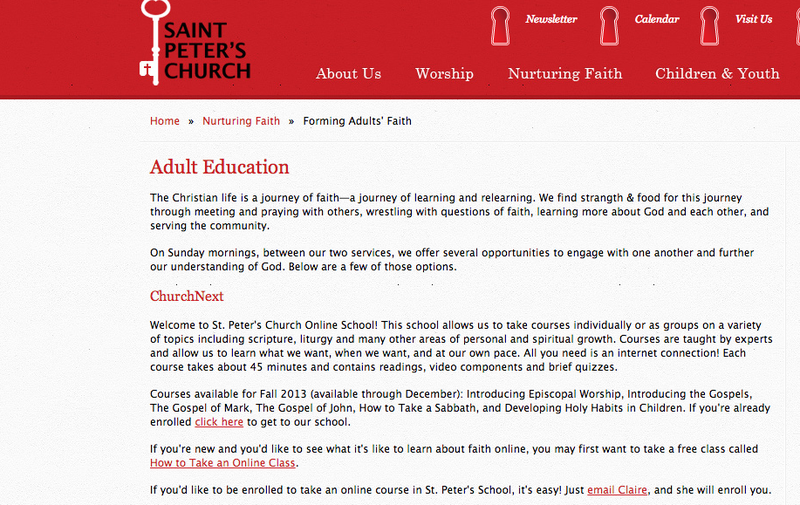 How many times have you and I heard it: your website is your church’s new front door? 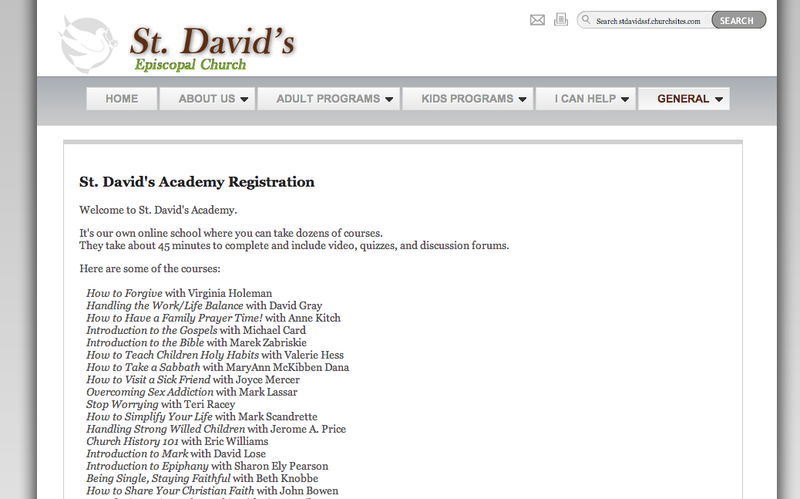 So we get a lot of questions from subscribers about how to best showcase their online schools on their congregation’s website. After all, we want the world to know our church is not only innovative and relevant, but that we deeply desire for people to grow closer to Jesus. So here’s what some of our congregations are doing. Let’s start with our friends at Nativity Episcopal Church in Scottsdale, Arizona, where the Rev’s Susan Snook and Wayne Whitney are overseeing their school – you can see the full web page here. This is a clean, easy to read web page. It uses some clip art that draws us into the copy. 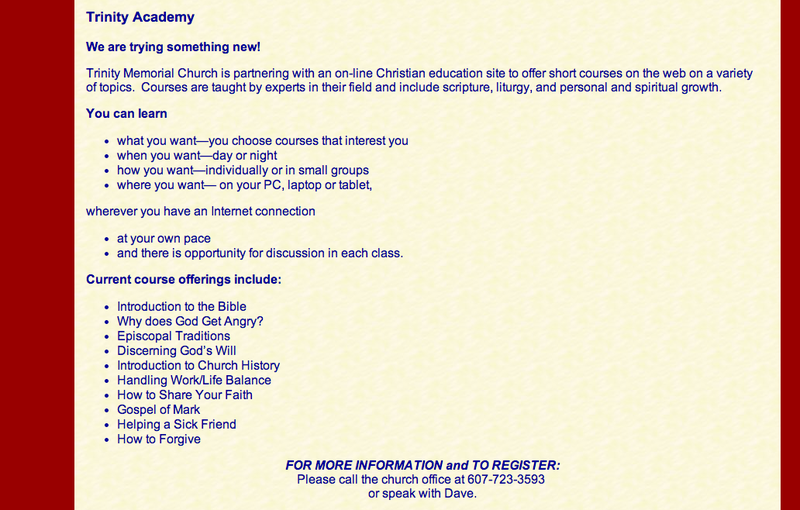 The page goes on to list the courses, showing the photos and a brief description of some of the classes, before offering people a way to contact Wayne to be enrolled. Trinity posted the link to their course right on their website. The benefit here is that their members can sign up directly for the class and avoid the invitation process of enrolling people in their school. 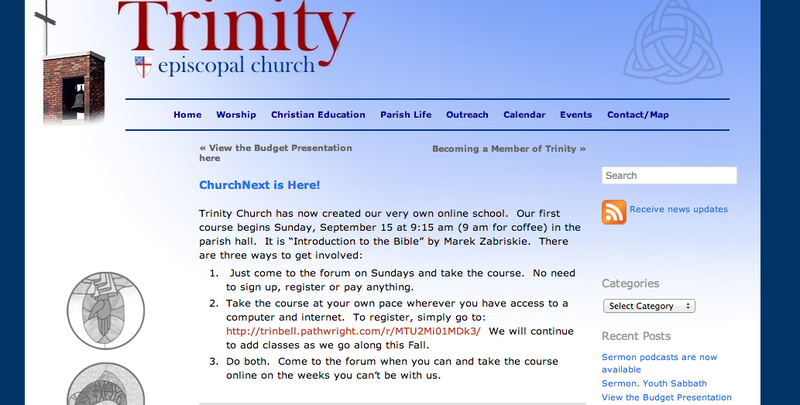 The concern is that anyone in the world who wanted to could sign up for this class – which opens the school to hackers – as well as the possibility that Trinity would be charged extra for members it does not know or want. 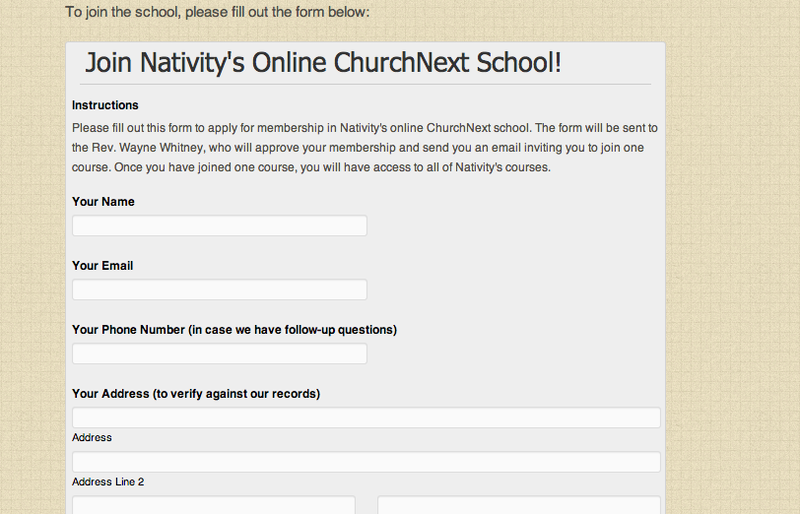 The page goes on, like Nativity’s, to invite interested folk to either send an email to the school’s administrator or to go to the churchnext.tv website and take a free course on How to Take a ChurchNext Class. Judy lists her email address after this course listing and asks anyone interested to email her. This is the simplest way to design a page. This page uses a recommended format in which current students can quickly access their school, inquirers can take a free course, and those who would like to be enrolled can contact the administrator. We can’t stress enough the importance of showcasing your school on your website. Showing the world that you have an online school is impressive on several levels – it shows you are innovative, relevant, and desire to help people grow in their journey with Christ. Here’s a link to a template we’ve designed that, in addition to the sites listed above, can help you design the perfect web presence to showcase your school. People look to live a more spiritual life for a variety of reasons – most having to do with improving their quality of life. In this class Episcopal bishop and theologian Mary Gray-Reeves tells us what the spiritual life is and how we might pursue it in this insightful new ChurchNext course. 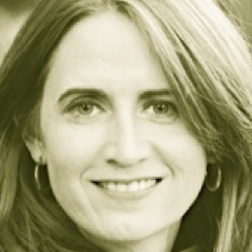 Mary Gray-Reeves defines spirituality as the exploration of the fullness of life, all things seen and unseen. And while one need not believe in God to be spiritual, the Western understanding of spirituality is directly related to religion. In this course, we will ponder more deeply what is meant by “spirituality,” how spirituality is interwoven with grace, how the basic beliefs of Christianity are united by the common thread of this grace, and how nurturing our own spirituality is really for the benefit of those with whom we are in relationship. Though we may have different motivations for seeking a deeper spirituality, we all have the capacity for growth and wisdom. This course is perfect for novices who are looking for ways to live more deeply into the spiritual life. The president of M.I.T. recently said that digital learning is the greatest innovation in education since the printing press. We couldn’t agree more. And we’re excited to be working in this burgeoning field of online learning, testing the waters of how churches can take this incredibly powerful tool into our contexts and shape disciples for Jesus. Since its launch August 12, 2013 hundreds of people have taken online courses with ChurchNext and we thought we’d devote this week’s blog post to telling you a bit about the goods and bads of what we’ve learned. A recent check of our opt-in, post-course questionnaire shows very good satisfaction ratings, with most people enjoying the courses and wanting to take more. For example, we asked ‘On a scale of 1-5, will you take another ChurchNext course (1=not likely, 5=very likely)?’ 74% of the 57 questionnaires answered said 5, and 14% said 4. We asked this question in various other ways as well, with similar responses. We have also received numerous emails from users expressing positive experiences with the platform and the classes they took. This is a story that ran last Friday in the Episcopal News Service about early responses to ChurchNext. More than half of our school administrators have set up their schools without asking for any additional help. Our aim is to provide as much helpful information as possible so that administrators, most of whom do not come from a tech background, could register, build, and launch their schools without needing to call or email our support line for additional help. Thanks to several helpful conversations we’ve had with subscribers, we have identified a few issues we’re currently addressing that will make it easier to build courses and manage students. We will be addressing these issues in forthcoming updates. We launched this project thinking that an online tutorial would be all we’d need to help people set up their schools. However we have since learned that a downloadable ‘Getting Started Guide’ would be extremely helpful to people. We are in the final stages of writing the first edition (collector’s edition!) and will let everyone know when it’s available. The manual, plus some smaller bugs which we’re addressing, should help those who are launching schools do so with greater ease and understanding in the future. We remain committed to our mission of creating online learning experiences that form disciples for Christ. We’ll have more results as they come in. Thanks so much for your support. Ever get mad at God? Anger at God can produce shame, depression, and alienation. However, as Episcopal priest and author Laurie Brock says, anger is not good or bad, but rather a neutral and natural emotion created by God. In this course, Brock calls on a lifetime of study and counseling to offer insights into what anger is, why we get angry with God, and how we might address this potentially debilitating occurrence. Brock believes anger at God can actually be good for us because of the potentially life-changing, transformative effect it can have on our lives. Is Online Learning Disrupting Our Education System? In a world where higher education is expensive and much of its funding is failing, what do we do? With tuition increases – as well as student debt – are there other alternatives to giving people the education they need that’s not only affordable but actually prepares them well for the work they want to do? San Francisco’s Lt. Governor Gavin Newsom recently sat down with Udacity co-founder and CEO Sebastian Thrun to talk about the potential of online education (Here’s the conversation). Thrun is a disrupter in his own right – who believes that, in 50 years, there will only be 10 institutions in the world that will offer higher education. Experimentation seems to be the name of the game. And there’s a lot of it going on. But there’s a lot of attention being paid to how people are learning – what are our learning styles – some do better in a classroom learning some things, others do better learning other things, face to face. Stay tuned.